This page is about the aircraft F4U-4. For other uses, see F4U (Family). The F4U-4 Corsair is a Rank III American naval fighter with a battle rating of 5.3 (AB) and 5.0 (RB/SB). It was introduced in Update 1.71 "New E.R.A". 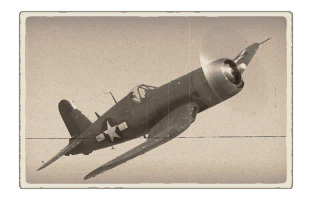 The F4U-4 is excellent at Boom & Zoom fighting. Its high energy-retention and acceleration make it the true pinnacle of the Corsairs. Although you don't get an air spawn, the climb rate of the F4U-4 makes up for that. When engaging an enemy, you should try and maintain an altitude advantage while keeping your speed up; speed is life, altitude is life insurance. Once you have attained an altitude advantage, you will want to roll then dive because the R-2800 P&W Double Wasp doesn't have fuel injection so if you bunt over into a dive you will most likely lose power momentarily. The six .50 caliber (12.7 mm) machine guns, while not as destructive as let's say four 20 mm cannons or the eight .50 caliber (12.7 mm) machine guns on the P-47, they will destroy any lighter aircraft with ease. 885 730 470 ~?? ~? 3 mm Steel plates on top of fuel tank and in front of cockpit. 12.7 mm and 8 mm Steel plates behind pilot. Being true for the entire Corsair series the most distinctive features of this plane is its huge R-2800-P&W 18 Cylinder Radial engine and its inverted gull wing. The Wing is impossible to rip in a dive as long as you don't pull a turn greater than 25 G's, which is almost impossible because the aircraft does suffer from compression above 800 kph. During the dive the aircraft tends to yaw severely to the right making you roll, possibly making the shot you need miss. The worst enemies for the F4U are the Ki-84, N1K1, A7M's, and some late mark Zeros. Their extreme turning ability would make any of the F4U-4's attempt at turn fighting worthless. In the worst case scenario when these aircraft managed to get an energy advantage over the F4U-4, escape from the encounter with a dive and try to lose the aircraft through the assistance of allied anti-air fire from friendlies or the airfield. 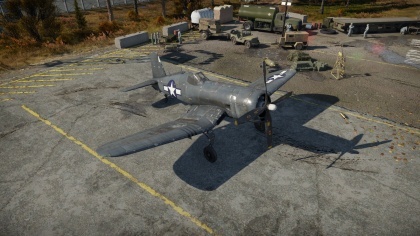 [Devblog] F4U Corsair: Sky pirates are back! This page was last edited on 7 April 2019, at 16:36.